Search results for: "walter white"
What we choose to send into space is a fascinating representation of our culture. From professional astronauts and Mars One applicants to plants and a soda can masquerading as a time capsule to robots, every individual and object we send into the cosmos becomes a symbol for qualities we hold dear. Thus, it comes as no surprise that employees from TVtag, a social networking site and app whose users check in and unlock information about the shows they watch, recently launched a Walter White bobblehead into space. This is a thing that happens frequently on the Internet now, fictional character are pitted against one another in rap battles to test their hypothetical lyrical skills, and this time it’s two different crews of busters: Ghostbusters versus Mythbusters. Actually, I guess only one of the parties in this video is entirely fictional, but with a theme like this, it’s easy enough to overlook that in the most recent installment of Epic Rap Battles of History. If you’ve encountered any of these videos before, you already know what to expect out of this new one. They’re fun enough for what they are, and if you’re into such things, this should prove to be a reasonably good time, or at least an adequate way to kill three minutes or so while you’re trying to run out that last bit of clock at work. Just try to keep the chuckles to a minimum so the people in the cubes around you don’t know that you’re up to anything fishy. Norman Reedus had an eventful Comic-Con. The Walking Dead star figured prominently in the show’s presence at the massive geek convention. 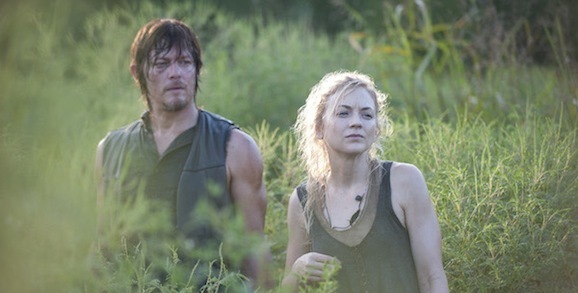 During interviews he revealed some of the feelings shared by his character, Daryl Dixon, when it comes to Beth, played Emily Kinney. Because he’s a fan-favorite, and unable to randomly wander around such an event without being mobbed, he also donned a clever disguise in order to roam around and check out the festivities. In the second half of The Walking Dead season four, the core group was forced to leave their prison safe house and splintered into various smaller factions. One of these was comprised solely of Daryl and Beth, which led to one of the best episodes of the entire year, “Still.” Not much happens from an external perspective, Reedus and Kinney are the only two credited actors, and the bulk of the action involves them getting drunk and talking. There are giant lizard-sized spoilers below, folks, try not to get stepped on. San Francisco sure hasn’t had a fun time of it during this summer blockbuster season. 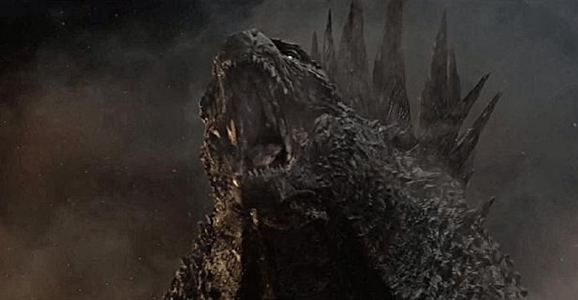 Before Dawn of the Planet of the Apes destroyed the city in a post-apocalyptic fashion, Gareth Edwards’ Godzilla let giant monsters run around and destroy things. There are probably more than a few ways that the City by the Bay could have been saved from utter destruction, and the most recent How It Should Have Ended video offers up some pretty solid suggestions on different places this tentpole flick should have taken viewers. At this point last year, we were already getting regular updates from the Georgia-based set of AMC’s hit zombie drama The Walking Dead. So far this off-season we’ve seen a picture of protagonist Rick Grimes (Andrew Lincoln) and got news about a new cast member in the form of The Wire alum Seth Gilliam, but that’s about it (for some reason I don’t think that rap battle with Walter White is official). 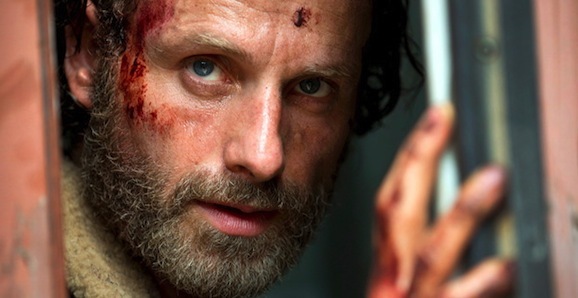 Executive producer, and comic book creator Robert Kirkman says this is an intentional move on the part of the production, but that didn’t stop him from talking about season five. Filming recently started on the next season of The Walking Dead and, according to Kirkman, talking to Entertainment Weekly, “There’s been a lot more secrecy on set.” The reason for this is the way season four wrapped up. Over the course of the TV show’s relatively brief lifespan, there has always been a passage of time that elapses from the time one ends until the next installment begins. If you watched season four, you know that it ended with many of the primary characters in peril, trapped in a boxcar in the settlement known as Terminus.